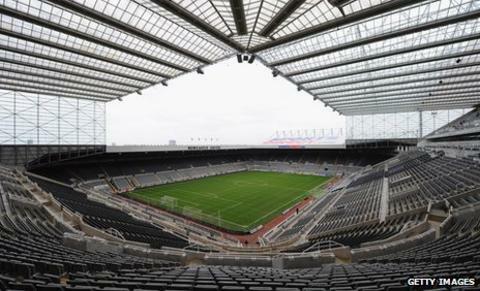 Newcastle United have renamed St James' Park the Sports Direct Arena after owner Mike Ashley's company. The club say the change is a temporary measure to "showcase" the sponsorship opportunity to "interested parties". However the St James' Park title has been dropped as the club does not think it is "commercially attractive". Newcastle are now searching for a "long-term sponsor to acquire full naming rights", possibly for both the ground and playing kit. Managing director Derek Llambias said: "Stadium rebranding offers a lucrative way for clubs to secure significant additional income." The club originally planned to allow sponsors to link their brand to the St James' Park title but that idea, put forward in 2009, is now replaced by the offer to purchase full naming rights. At the time of the 2009 proposals, Newcastle were struggling after being relegated from the top flight. But the team are now flying high - currently third in the Premier League. Reacting to news of a possible name change two years ago, Newcastle fans told BBC Sport that the idea was a "nightmare" and "abysmal". Although it has become common for clubs to hand naming rights to sponsors when they move to new grounds, it is unusual for a traditional stadium to have its name changed. In a statement, Llambias explained: "Our aim for Newcastle United is to continue to deliver success for the fans and everyone associated with the club. We must make this club financially self-sufficient in order to deliver that success. "To grow sustainably and allow us to invest in our future, we will need to rely increasingly heavily on commercial income. "These are very difficult economic times and the board have a responsibility to maximise all revenue streams for the benefit of the club." Reflecting their self-sufficient aims, Newcastle published a mission statement in the matchday programme for their Premier League game against Tottenham on 16 October in which Llambias said the club were aiming "towards being able to operate within the boundaries of Uefa's financial fair play rules". That statement came after the Magpies reported operating losses, before player trading, of £37.7m in 2008-09 and £35.5m in 2009-10. Newcastle's intention to watch their budget carefully has been clear in the departures of Andy Carroll, Kevin Nolan and Joey Barton, while the club's mission statement made clear they would focus on players who could "develop and realise their potential". Another potential revenue stream is making a shirt sponsorship deal available to any company interested in taking on the naming rights of the stadium. Llambias added: "Naming the stadium the Sports Direct Arena helps up to showcase the opportunity to interested parties. "We are now actively seeking a long-term sponsor wishing to acquire full naming rights for the stadium. "Our shirt sponsorship deal with Northern Rock will also expire at the end of this season, which presents would-be sponsors with the opportunity to acquire both the naming rights and shirt sponsorship deals." St James' Park is the oldest ground in the north east with football having been played on its turf since 1880. Newcastle East End moved to the ground in 1892 before changing their name to Newcastle United. After major development, a new-look St James' Park was opened on the site in 1905. Read more on Named or shamed?